The book is mine! It arrived this afternoon. To celebrate the arrival of my limited edition Wood Elf army book i present to you part 3 of my review, enjoy. Orion in winter, not sticking to the fluff. Lets start off by looking at the special characters beginning with the King in the North Woods himself, Orion. First off he is 600 points, so in a standard 2400 point game he takes up all your lord points. What you get is the Glassyist of Glass Cannons. WS:8 S:6 A:5 with Frenzy, ASF and Unbreakable. Defense wise he has T:5 W:5 with a 5+ ward save. So he falls over quickly but will take quite a number of enemy with him. He also has either a strength 7 bolt thrower shot or a Multiple shots 6 strength 5 bow attack, and at the start of each turn he gives devastating charge to all Wood Elf units within 6. Personally i wouldn't take him unless you have a life mage in your hero selection. But he still could be fun in a fluffy game. Finally i spelled his name right! This is the only Wood Elf Special Character i would take to a Tournament, why? Because he has the combat stats of a old Treeman Ancients just with a few new tricks, namely 1 level in the lore of Beasts (hello Wildform), a 2d6 strength 2 killing blow shooting attack (and he is BS:7), Frenzy and Hatred. His only draw back is that he costs 385 so he doesn't allow room for much else in the lords, but he makes up for that with sheer combat punch. A 4+ ward save, a weird shooting attack and Unbreakable if he is alone along with a average combat profile all for 260 points. While he is the cheapest of the lord level character he is the worst. I cant think of a use for him that you cant get out of a kited up Glade Lord. She is now a Hero level special character. She is also a level 2 shadow wizard with Blessings of the Ancients. You can now take non forest spirits in her army but the forest spirits can still ambush from the woods, so a few Treeman, Drycha and the Acorn could result in some assuming moments. Yes they can still ride a dragon and yes they are in the hero selection, so that alone should make them worth consideration. They also still have their magic bows, which are better than they are before, and the rule that means that so long as one of them still lives the other will get back up at the end of the phase. The only downside is the old metal dragon they ride on, which is sheer torture to assemble. So we only get 5 special characters, which isn't that bad, and to be fair the only one i wouldn't recommend is Araloth, but the others are all worth at least one game just to see how they would preform. So onto the Army Book magic, which is both High magic and Dark magic with different lore attributes. For every spell successfully cast from this lore (and isn't dispelled) place a protection counter next to the wizard/ the wizards unit. Whenever the unit suffers a unsaved wound remove one counter instead of a model and treat the wound as saved. In a army of toughness 3 no armour save elves this is perhaps one of the best lore attributes you could ask for. And considering that there are many low casting value spells in the lore of High magic it will be easy to accumulate these counters. 8+ to cast for 2d6 strength 4 shots at 19 inches. Not bad at all. It gives an army that needs strength 4 shooting 2d6 strength 4 shots. And its a sig spell so you can always default to it. 7+ to cast and it removes all remains in play spells and ends all spell effects on the target unit. Only take against armies who have a lot of buff/debuff spells, otherwise pass. An interesting tactic is to take this spell, and cast it only for the protection counter counter. Your opponent probably wont dispel it and you gain a protection counter, yaay. 5+ to cast and a targeted friendly model within 18 regains a wound and causes fear until the start of your next magic phase. The boosted version is 10+ to cast and the target regains d3 wounds. This is a very useful spell considering the low toughness low armour save theme the Wood Elves have a adopted. It can also come in handy if Durthu or a Treeman takes a few wounds and you want to keep them fighting fit. Oh Hand of Glory how i admire you, for a mere 5+ you can increase either a target units WS, BS, I or M by d3, and for +10 to cast you can increase all by d3. So far the best use for this spell has been to cast it on a unit of 20 Glade Guard with he Swiftshiver arrows (multiple shots 2) and watch them mince their targets as they hit on at least a 4+. There are probably some other units that would enjoy this spell just as much, so have fun finding out. 8+ to cast and i makes a target unengaged unit within 24 Ethereal for a turn and allows hem to make a 10 inch move as if it were the remaining move phase, the boosted version is a 16+ cast and the unit makes a 20 inch move instead. Endless fun can be had with this spell. Is your unit of Waywatchers about to be charged by a unit of Monstrous Cav next turn? Make em Ethereal and have them walk out of there. Is a unit of redirectors trying to redirect your Treeman/Wildrider unit? Simply walk said unit away from the chaff. Endless fun can be had with this spell. 12+ to cast and you get to place the large round template anywhere within 30 of the caster. Any model under the template suffers a S3 hit (S4 for flyers) and if the unit/s suffer any unsaved wounds then they get a -1 on all to hit rolls (both CC and shooting) and any shooting attacks that don't require a BS roll only work on a 4+. Not bad but not great either. If you are facing an army whose average toughness is 3 or lower then keep it, if the other armies average toughness is higher than 3 then swap it out for either one of the sig spells. 13+ to cast which allows you to target a single enemy model within 24, that model suffers a wound on its armour save value(so a model with a 5+ armour save would suffer s wound on a 5+), in addition if the model is carrying a magic item then randomly choose one (if they have only one then that one is chosen) and on a 2+ it is destroyed. Hey is that the Banner of the World Dragon? Not any more. This spell is defiantly useful in a Wood Elf army so keep it and watch as tooled up Demon Princes cower in fear of your magic phase. 19+ to cast which targets a single enemy unit within 24. Every enemy model suffers a S4 flaming hit at the start of each magic phase, it is a remains in play spell. Very useful for removing large blocks of Chaff (skaven slaves) or other Wood Elf players Treekin or Dryads. However it is the hardest spell to cast in the lore so its up to you if you think you can use it. Thats the lore of High magic, and i think its better than the lore of Dark magic for reasons i will get into when i talk about Dark magic. I like almost everything about the lore of High. All the spells bar Tempest are useful to Wood Elves and the lore attribute is just what our fragile wizards need. So lets take a look at the lore of Dark magic. Whenever a from the lore of Dark magic is cast (and not dispelled) on a target enemy unit place a vengeance counter next to it. Whenever a unit with a vengeance counter suffers a hit from a spell from the lore of Dark magic increase the amount of hits by d3. In my view this is worse than the High magic attribute, d3 extra hits isn't that great. It could be interesting to Chillwind and then Doombolt a unit of knights but its nowhere near as good as the protection counters from the lore of High. 12+ for 2d6 strength 5 shots with a 18 inch range, 4d6 for the boosted version at 24 to cast. If you like the HODA! then this is for you, and what self respecting Wood Elf player doesn't like the HODA! This should be a auto default spell if you take this lore, then watch as just about every infantry unit in the opposing army gets bowled over by this spell. For a 8+ cast a target unit gets +1 strength and you gain d3 extra power dice (on a roll of 3 the caster suffers a wound). This spell is perhaps more useful for Wood Elf players than Doombolt as all our core infantry could really use S4, the power dice are nice but you are really casting this for the bonus strength. Once again this is a auto default spell, don't be concerned by that, these are the two best spells in the Dark magic lore for Wood Elf players. 5+ to cast for a 24 inch 2d6 strength 2 shooting attack, in addition if the target suffers any unsaved wounds then they suffer a -1 to their BS until the start of your next magic phase. If you roll this spell then default to one of the sig spells. Strength 2 without other special rules is meaningless to everyone but skinks nowadays, in fact skinks are probably the only unit you would want to target with this spell. 9+ to cast, 24 inch hex spell that reduces a target units WS and BS by d3. The boosted version reduces the targets S and I instead and is a 12+ to cast. Not a bad spell to cast on a unit about to charge any of yours, i would advise using boosted over non boosted just because S and I are more vital to a combat than WS, but its up to you. 9+ which targets a enemy unit within 24. Every model in that unit must pass a WS test of suffer a S4 Armour piercing wound. Great for dealing with things that we have had issues with in the past, like zombies and skaven slaves. Its still a situational spell though so make sure you are confident of success before casting. 10+ to cast. It targets an enemy unit within 12 and that unit cannot benefit from the generals LD or the BSB re-roll on LD tests. In addition if a unit fails a LD test then it gains -1 LD until the end of your next magic phase. Combine with the Treeman's Terror and you could have some fun. Skaven, Orcs and Goblins and frenzied units will fear this spell so go nuts and watch as their resolve crumbles. 11+ to cast gets you a 18 inch small blast template that scatters d6. Any unit underneath the template suffers a S2 hit with no saves allowed . In addition for each unsaved wound caused roll a d6, for each 4+ the caster gains a wound to a maximum of ten. You know how i said S2 wasn't great unless it had other special rules backing it up? Well Soul Stealer shows Chillwind how its done. Definitely a keeper if you roll it, and it provides a nice way of dealing with things like Dire Wolves without using a unit of Glade Guard to shoot them off. 15+ to cast gives you a magical vortex that causes any model underneath it to either pass a strength test of die. Its range is the wizards level times the artillery dice result, and don't roll a misfire, ever. The only real advantage this spell as over Dwellers is its casting cost. If you didn't roll Dwellers on a life mage (or don't have a life mage) then keep this spell, otherwise trade it for one of the sigs. If it weren't for the Signature spells i would advise against taking Dark magic (except for in one off games versus Dark Elves, for ironic reasons), and i don't think 2 good sig spells can trump a whole lore of decent spells that you get from High magic. If you are dead set on taking Dark then only have it on a level 3, that way you can take the 2 sig spells and it might be a good idea to take Caligors Stave and have Treesinging as your 3rd spell. Some of you may be wondering at the title of this post. Its the brief version of my overall feelings on this book. Shooting and magic wise we now have a way to deal with every type of unit in Warhammer. Are you facing a Horde army? Then fire magic and Swiftshiver shafts are for you. Are you facing an Ironclad 1+ armour save army? Then Metal magic and Arcane Bodkins are for you. But that doesn't answer the question that some of you may have which is: Is this a good army book. My answer to that is yes with a but. Yes it is far better than the old book, we can now take on armies and win where previously there was only a very slim chance of victory. But this is still a fragile book, you still have an army comprised of mostly T3 unarmoured elves who die from stiff northerly breezes. The Guys over at the Jaded Gamer Cast summed it up nicely by calling the wood elves the "Worst Elves". By that they mean that the Wood Elves are the worst out of the High, Dark and Wood Elves. I agree but would add that being the worst out of 3 very good army books is still a good thing, we can still win games. Units like Waystalkers and Shadow Dancers open up options and tricks that we previously didn't have. The magic options now on offer make us formidable to many armies and while we do lack a Prowess, the enchanted arrows more than make for it. In conclusion i like this book, yeah it wasn't what the Wood Elf community wanted but its still a very good book. and the models are all excellent and reasonably priced. 5 Wild Riders/Sisters of the Thorn will only set you back 50 dollars and Wildwood Rangers/Eternal Guard is only 53 for 10. I look forward to playing with my Wood Elves where as before i was growing slightly tired of them, but now i cant wait to use them. Before i go this wont be the last i write about the Wood Elf release, i want to talk about just how popular the Wood Elves really are the the model/price side of the release. So until next time. Time to dust off my old woodies I think. I am debating between wood and dark elves as a second wfb army to my ogre kingdoms. What do you think? I love the new wood elf modelsbut have always been a fan of the druchii fluff. Dark Elves are more durable, better in close combat and have more access to different units. However the Wood Elves are able to take on all types of unit and we have access to more magic lores than the Dark Elves. I am looking for something with more tactical options and a bit more shooty than the ogres. Would dark or wood elves be the better option? Not too worried about survivability as they are both elves plus ogres are tough and looking for something different. Actually I'm thinking that wood elfs are even better than high elfs or dark elfs. We got access to more lores than any other army, magic arrows give endless number of possiblities. With new poison arrows a chance of wounding a super tough, thing with very high armour save will not be smaller than 1/6 unless it has a ward save. Also if you increase the balistic skill by d3, glade guard with multiple shot 2 arrows will be tremondously good. Also forest give us a very big advantage. We ignore negative effects from them and can choose the type of forest. Imagine a block of 20 eternal guard in a forest that grants poison attacks. With both prowess rules, in forest in this scenario a core unit like eternal guard will be tremondously good. Can fight from extra rank, so total of 4 rows, rerolls ones to wound and rerolls to hit rolls due to asf coupled with poison. Sweet! Additionaly according to my math unit of 5 Wildriders have probability of 94% of killing hydra in one turn assuming they charged and did't not lose frenzy earlier. Additionaly if we got the spell that can make unit ethereal, than imagine how deadly it can be if we cast it on a unit in close combat, and the opponent unit can not attack it unless it has magical attacks! Wood elves are extremly good!!! 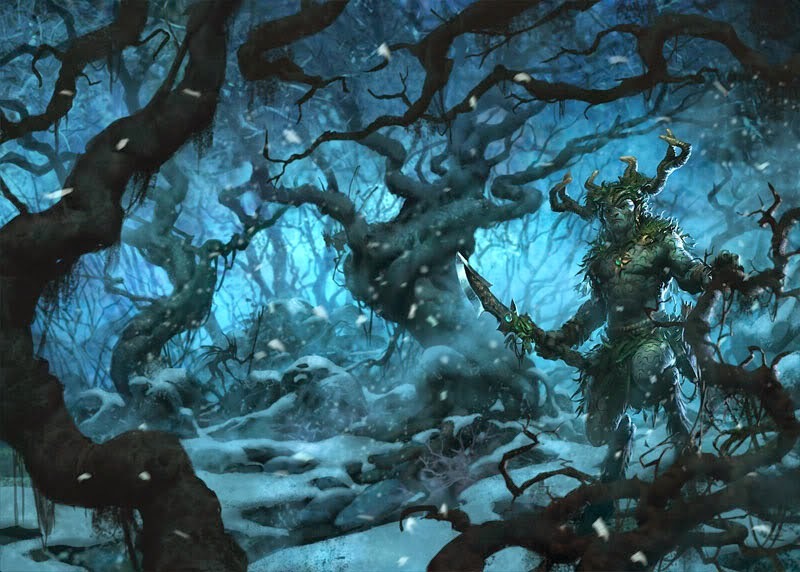 So far I have only played 1 game with the new wood elves, and yes hand of glory on swiftshiver glade guard is a wonderful thing, and walk between worlds (that ethereal spell) is very good when used on a Treeman. In that game I used Treekin and Treeman both of whom did well, the Treekin held up a large block of Saraus of a 3 turned and the Treeman chewed through some zombies and the Tree whacked a bastiladon. A quick aside Tree Whack makes up for the lost strength on the Treeman, it is very effective against all non-infantry and cavalry models who do tend to have low initiative. I used the forest for the +1 to cast on all lores benefit ( I took a gunline list and all my combat punch was Treekin and Treeman) , and that was a big help getting vital spells off. After that game i agree that wood elves are good, maybe even very good (I have yet to play enough games to tell). As for more options try a different arrow type on units of 10 to 20 glade guard. For example I have 20 glade guard on swiftshiver, 20 on true flight, 10 scouts on arcane bodkins and 10 scouts on hagbane tips. This means that my archers can counter every unit in warhammer. They are backed up by 15 waywacthers so there isn’t a lot that my archers cant counter. As for list ideas I would like to do a all mounted list. Glade Riders in core, Sisters, Wild Riders and Warhawks in special with Waywatchers and Eagles in rare. I want to do a troll and go 120 glade guard with poison in 2000 pts game vs dwarfs.